‘Do you know the Five Lamps?’ If you’ve heard this question before – and been foolish enough to answer in the affirmative – you’ll know not to answer it again. Essentially it’s a peculiarly Dublin way to tell someone to shut-up or to feck-off: ‘Do you know the Five Lamps? Well go hang your bollox off them!’. No one actually knows how this old saying originated. Well, how could they? But hats off to whichever Dublin wit it was who came up with it. Now it’s part of inner city Dublin culture. 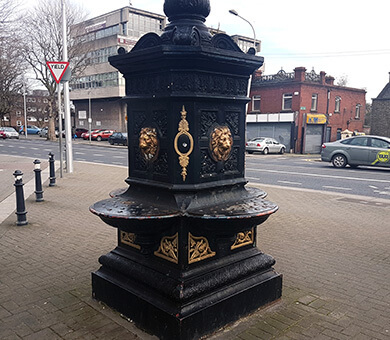 The lamps in question are in Dublin’s North Strand area, situated at the junction of five streets: Portland Row, North Strand Road, Seville Place, Amiens Street and Killarney Street. There it is, sitting an island in the middle of the road: a decorative five-branched lamp-post. The structure was created around 1880 as a memorial to Lieutenant-General Henry Hall, a soldier from Athenry. He also had an address in Stillorgan. Merville House, his old house there, is currently home to NovaUCD, the university’s innovation and technology transfer centre. Henry had served in India with the Bengal Army and had been superintendent of the Merwara region in India for thirteen years. When he died in 1875 his will made provision for the erection of a drinking fountain ‘to encourage sobriety’: this is that fountain. You can still see the four basins at its base which once held water. These were filled from spouts in the shape of lions’ heads, also still intact. Originally there would have been metal cups chained to the fountain to facilitate on-the-spot refreshment. The abstemious Henry would doubtless be pleased to see that the Five Lamps pub across the road has been closed for several years. A local theory exists that there are five lamps because of the five streets which meet at this junction. Another theory is that the lamps commemorate the five major battles fought during the Indian Mutiny. Or that they represent the five lamps lit for luck during the Hindu Diwali festival. A more mundane explanation is that this is simply an example of an off-the-peg five-lantern design. The fountain was manufactured by the Sun Foundry in Glasgow; the two fountains in the People’s Park in Dun Laoghaire were also made at this foundry. During World War II, three bombs were dropped by German planes in the North Strand area, killing 28 people, injuring 90, and damaging or destroying three hundred houses. But The Five Lamps survived the attack. They went on to get a mention in the Boomtown Rats song Rat Trap: ‘Just down past the meat factory door, The Five Lamp boys were coming on strong’. They’ve had a brewery (again, not especially encouraging of sobriety) named after them – and an arts festival. 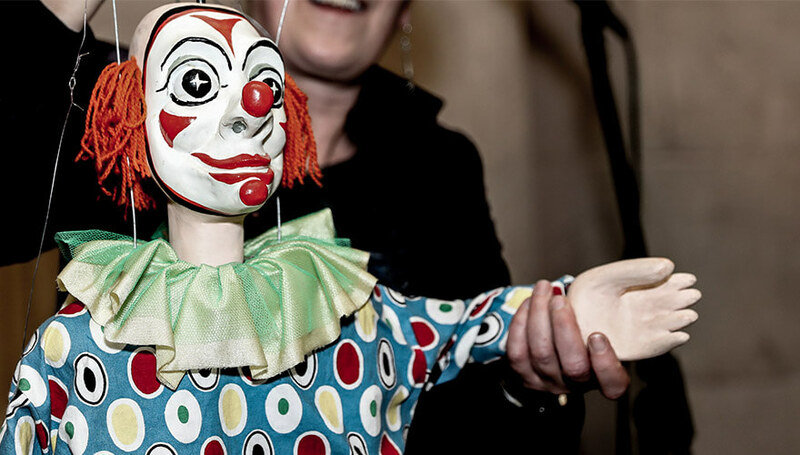 The Five Lamps Arts Festival is an annual local festival in Dublin’s north city featuring a series of shows, plays, exhibitions, workshops and tours. From Dylan Joyce’s photographs of the daring antics of inner city swimmers to Julie-Rose McCormick’s puppet-show take on Beauty and the Beast (informed by NAMA), the festival celebrates the talent we have right here, at the heart of Dublin. It also brings Dubliners and tourists to the area – and a bit of a shine to the Five Lamps!